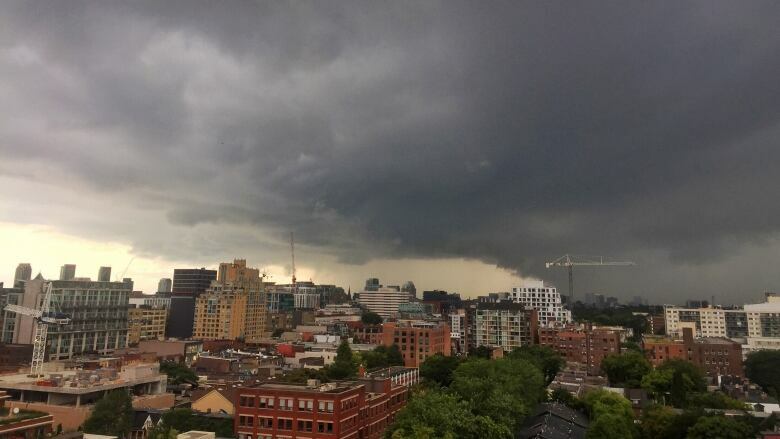 Heavy downpours and thunderstorms hit the GTA after Environment Canada issued a special weather statement Friday afternoon. Heavy downpours and thunderstorms hit the GTA, causing flooding in some areas after Environment Canada issued a special weather statement Friday afternoon. GO Transit is asking commuters heading to Union Station to give themselves extra time as a result of flooding in the area. The TTC says there is no service on Line 3 (Scarborough RT) due to flooding. Shuttle buses will be available for commuters. The TTC also says there are major delays between Long Branch Loop and Humber Loop because of the flooding. Some users on Twitter have reported that some roads in the city have also started to flood after the rainstorm began this afternoon. The city says that parts of the Don Valley Parkway are blocked due to rising water levels. Traffic is also moving slowly on Lake Shore Boulevard due to flooding around the Exhibition grounds. Water is reportedly half way up car wheels. The westbound Lake Shore ramp to the westbound Gardiner Expressway by the Humber River is also affected by flooding. Apart from the special weather statement, a rainfall warning had also been issued by Environment Canada for several GTA areas, but it ended around 10:40 Friday evening. Some storms will be "very slow moving," and certain areas could get more than 50 mm of rain. The statement runs in conjunction with a rainfall warning issued for Toronto. Toronto's Pearson International Airport has asked travellers this evening to check their flight status due to thunderstorms in the forecast. The storm comes just days after Toronto was overwhelmed by a sudden rainstorm. The city has warned on Twitter that a flash flood can happen without warning and is asking people to keep away from low-lying areas as well as large bodies of water. It is also asking motorists to avoid flooded roads, use extra caution and allow themselves extra time when commuting. The city also says that its storm readiness plan is in place and that city crews will be responding to 311 flooding calls.